I have been teaching a different letter of the alphabet each week to my two youngest grandsons: Kona (4) and Tahoe (2). My focus for Kona has been writing the letter and learning its sound in words. My goal for Tahoe was letter recognition and vocabulary development. Next I began teaching the consonants and thought I would just go in alphabetical order (mostly so I could easily remember which letters had already been taught). That was working fine until Kona pleaded, “Mimi, when are you going to teach the letter R? It’s my favorite letter!” How could I disappoint such an eager learner? So I made lesson plans for the letter “R” (and I had to make myself a note to return to “J” in the coming weeks). I planned this as a four day lesson plan, doing at least two activities a day until I had taught something from each multiple intelligence. If you use this lesson plan, I encourage you to do one activity from each multiple intelligence. Kona preferred this adorable story about a robin who can’t fly south, so he hops instead. Tahoe loved this story about an elephant helping a rainbow. Make a list of words that begin with the letter R as you read any book or poem to your child. Visit a local river for a nature hike or a picnic. Use the letter “R” to inspire artwork. I had Kona make a picture of a robin with the letter “R”. Since Tahoe loved the book about the rainbow, I helped him make a rainbow out of construction paper and then he used dot paints to decorate the letter “R” to look like a rainbow (sort of). Kona made a robin with his capital R.
I helped Tahoe create a rainbow and then he used dot paint to decorate his letter R.
Make rice pudding: Cooking with my preschool-aged grands is an interpersonal activity since they need to work with an adult to follow all the directions in the recipe. I decided to make rice pudding since that is one of their favorite desserts. Here is the recipe we tried. Kona loves to crack the eggs. Kona is careful when measuring and pouring the milk. Now the mixture goes in the baking pan. All done. Smells good too! Play charades: Charades also requires at least two people to play. My grands are still young enough that we have to do some of the charades together. As they get older, charades will be used as a guessing game. Once you’ve chosen the words you want for charades, place the picture and/or spelling of each word on a separate piece of paper or index card. These are some of the “R” words I used for this activity: run, rabbit, robot, rain, and railroad crossing (Kona’s idea). Ring toss with cones: I made rings out of pipe cleaners and we tossed them over orange cones we already had at home. We had two sizes of cones. Kona preferred to throw the cones at the shorter cone. When studying the letter R, Kona had to say a word with the “r” sound before he could toss a ring over a cone. 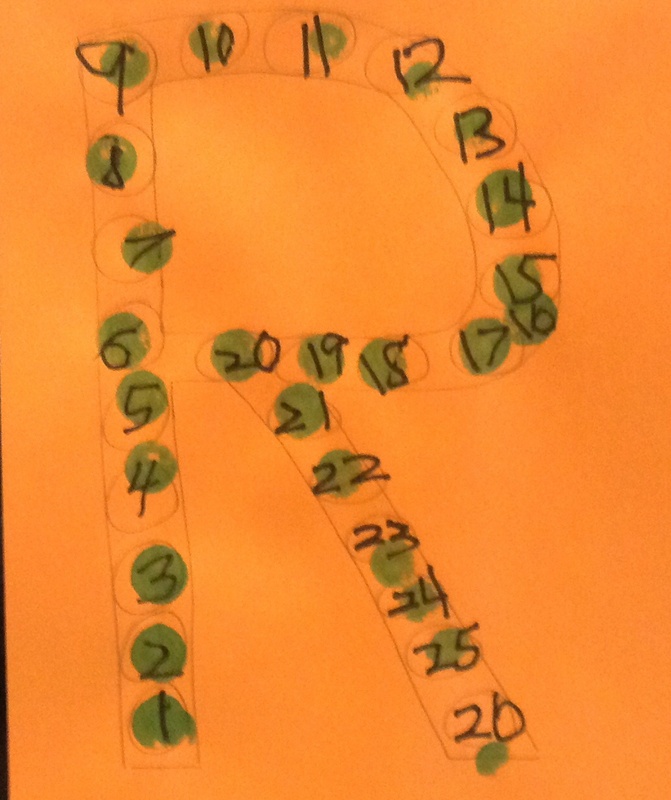 Counting/writing numbers: I had Kona paint dots on a construction paper letter “R”. Then as he counted the dots, he wrote the numbers. You could also have preschoolers count the letters in alphabetical order until they get to “R (which is the 18th letter). I frequently have the grandsons use dot paint to help practice writing their letter of the week. I had Kona practice writing his numbers as well by counting each dot. Rectangles: Make rectangles out of pipe cleaners, dry spaghetti, etc. and have the child count the sides and corners. Give them a construction paper “R” and some art materials to decorate it anyway they want. Give each child a chance to look at the “R” books by themselves. Ask each child to tell you their favorite “R” word and why it is their favorite. As you can see, some of the multiple intelligence activities do not have to be involved or take a lot of preparation. Preschoolers learn so much from activities that are simple to do. I hope you find some ideas in this lesson plan that will work for the children in your care. If you are interested in seeing more lesson plans using multiple intelligence strategies, please sign up to follow my blog.